It was 11 p.m. and Husband pushed the gazillionth mini-marshmallow into the frosting on the side of the mammoth butterfly cake. He was smiling. Finally. He was exhausted after a long day with the kids. I was exhausted. 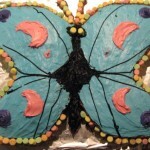 But the butterfly party was the next day, at our house, and I had committed to a butterfly cake. Husband’s an artist. He can do it! I gave him an overview of how I thought the cakes could be cut to create a butterfly. We looked for an adequate platform. Baking sheet? Too small. Tray? Too small. Large butcher block used for carving big hunks of meat? Perfect. Then I whipped out the bag of chocolate and vanilla frostings, food coloring, squirt can icing for writing and drawing intricate wing designs, and mini-marshmallows. He looked miserably at me. “I know you can make it beautiful!” I tried to buck him up while offering additional strategies and pointers on how he could make it so. He spread his arms wide to nudge me away and I got the hint. Back off. Okay. I puttered around the other side of the kitchen, occasionally making furtive glances over his shoulder. He gave me the back off hand signals again. We were expecting 15 three and four year olds. I could only pray. Now, I must confess that we should be pretty seasoned party throwers by now. “Remember when I made you do the puppet show?” I reminded Husband as he smoothed royal blue icing over the wings. He smiled. Well, grimaced. That was the jungle safari theme when Son turned two. I handed Husband the animal puppets and little stage then attempted to “narrate” his performance. Kind of a bad idea. “What about the cupcake cake?” He asked. Oh yes, that was the cake idea I got from a magazine. It was…interesting. There was the cooking party when Son turned four, the dress up party when Daughter turned three, and most recently, the Charlie and the Chocolate Factory party for Son’s sixth birthday when I thought a burping contest would be so much fun except most of the boys didn’t know how to burp, resented the one kid who could, and fought over the trophy prize (and one well-mannered boy left the room in disgust). “Fine, I’ll do it.” I grabbed the knife and sliced rounded corners on the top of the wings. We both agreed it looked much better. We finished pressing the marshmallows into the chocolate frosting and stood back to admire our handiwork. It was kind of gross and… kind of beautiful. And really big. The next day, I couldn’t quite tell what Daughter thought of the huge butterfly cake we put in front of her. It might have been a bit overwhelming – being half the size of her and all. It was probably…. just what she expected. And wanted. Then we chopped it up, doled it out, and lots of little hands put forks to mouths and ate through the blue frosted wings, black body, and puffy marshmallow sides. Then they licked their lips in yummy satisfaction and started running around the room again.